Heavy Duty packaging cutter with 90 degree cutting base and adjustable depth gauge. 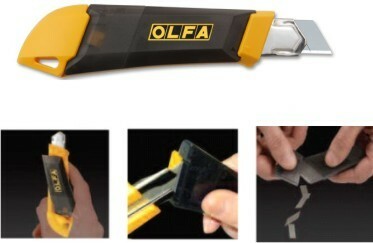 Great for cutting foam board & corrugated plastics. Sure-grip heavy duty utility cutter with a ratchet wheel lock and anti-slip rubber grip. This heavy-duty utility knife features an all-over rubber grip for professional comfort and control. Acetone resistant handle, auto-blade and a heavy-gauge stainless steel blade channel that holds blade tight.